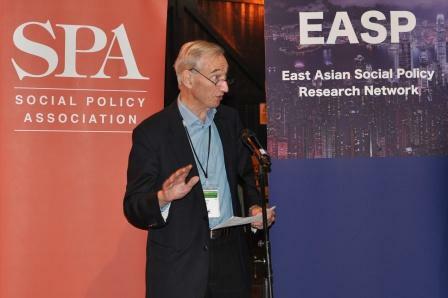 The 2012 Social Policy Association Awards Ceremony was held during the Association’s Annual Conference, presented at the Association’s July Annual Conference (for 2012 co-hosted with the East Asian Social Policy research network) at the University of York. The awards were presented by the SPA President, Sue Duncan. The 2012 winners were: Receiving the UK Social Policy Association (SPA) 2012 Special Recognition Award, Alan Deacon, Emeritus Professor of Social Policy at the University of Leeds, Professor David Byrne of the School of Applied Social Sciences at Durham University, Fiona Williams OBE, Emeritus Professor at the School of Sociology and Social Policy, University of Leeds and Nicholas Deakin, Emeritus Professor of Social Policy at Birmingham University. 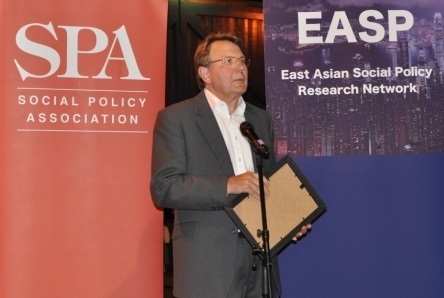 Receiving the 2012 Outstanding Contribution to Social Policy Debate, Analysis and/or Practice Award, Lord Richard Best and receiving the Best Postgraduate Paper Award, Ilana Shpaizman, a PhD candidate at the School of Public Policy at the Hebrew University in Jerusalem. Congratulations to our winners and to all those nominated. 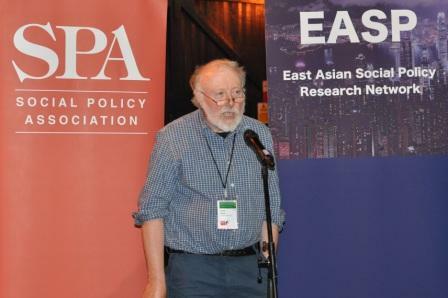 The Special Recognition Award is made to SPA members who have retired, are due to retire, or hold an Emeritus position and marks contributions in the field to research, teaching and learning, impact on political process and discourse; and recognises the esteem in which the recipient is held. Receiving his Award, Alan told those present: “I am delighted and very proud to receive this award from the SPA. I have been a member of the Association for over 40 years and have always found it to be the most friendly and mutually supportive of the learned societies. Now its role in defending both the substance and study of social policy is even more vital in what is without question the coldest of cold climates”. A public lecture made by Fiona, at a colloquium on her work to mark her retirement from the University of Leeds on 29 June 2012, will shortly be available as a webcast on the website of the University’s School of Sociology and Social Policy. The Award recognises a significant and lasting contribution made by an individual or organisation to the field of social policy – through campaigning, lobbying, service provision, fundraising, journalism, funding or dissemination of research, or other non-academic means. 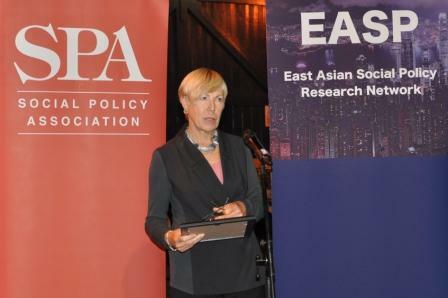 SPA President Sue Duncan, described Ilana’s paper as “sophisticated in its use of theory”, and her written style as “a model of clarity”. Ilana gave her winning paper at the 2011 SPA Annual Conference in Lincoln. 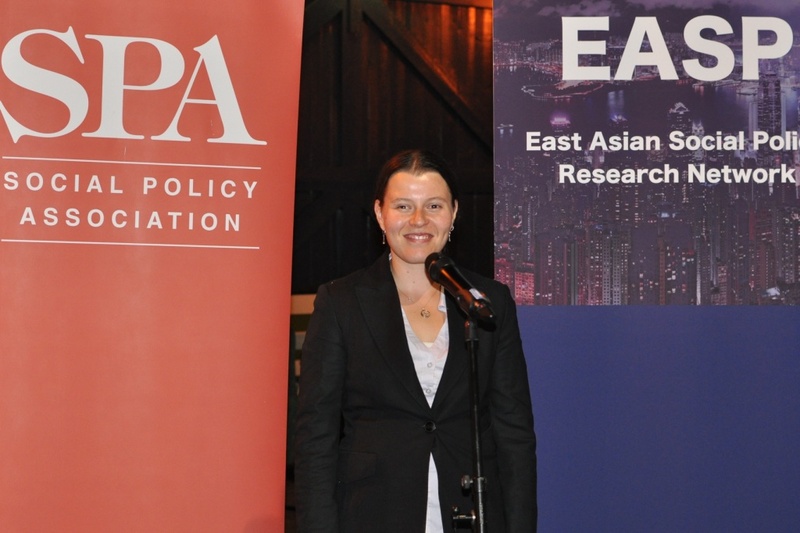 SIlana’s dissertation is about the influence of ideas on policy changes and her case study is the Israeli integration policy since 1990. After finishing her PhD she hopes to proceed to post-doctoral work abroad and, after that, to find a tenure track position at one of the universities in Israel.